For the first time in recent memory a cool rain greeted the morning. Its arrival punctuated yet another long dry season in the west. Layers of white vapors shrouded the foothills, the valleys towering peaks looming above lost among gray layers of moisture laden clouds; a stark contrast from summers heat, haze and dull blue sky that’s beat upon us for the past months. Before me the Bitterroot River flowed, a ribbon of black viscous through a valley of dying grasses, dull cottonwood, willow and river birch. I looked to the currents for signs of life. None were immediately visible. Exiting my vehicle, I walked down the steep bank to the rivers edge. The Bitterroot is a big river. Expansive reaches of bleached rock lay exposed on inside corners, evidence of immeasurable power and more turbulent event. An eagle cried in defiance of the weather lost somewhere among the corridors damp cottonwoods. 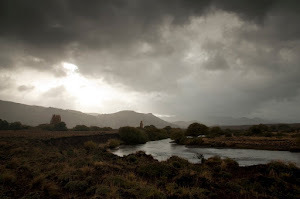 Before me a broad river flowed; riffles drained into smooth long runs resembling those waters of the great Northwest where the oceans anadramous travelers have begun to arrive home to their native rivers. A small group of geese restlessly took to the air in preparation for a journey that would take them to warmer climates. At the head of the run before me, I envisioned where to begin working a short length of line, eventually extending the cast to sufficient cover the water; lessons drummed into my skull from those initial days of steelheading with Collin Schadrach and Greg Smith. Years of trout habits initially muddled a view that was far different for a fish that often wanders thousands of miles before returning home. 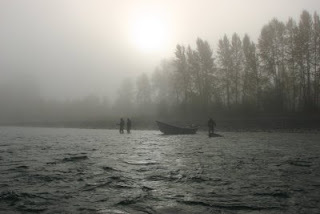 With no wind the rhythmic cadence of a single spey would adequately cover the broad rivers currents. A greased line fly led by the pull of a soft line sufficient to entice any willing taker. Rain continued to drive the illusion. The valley’s damp ceiling and chill fed the impression. The air smelled of dried and decaying vegetation. For the first time since summers PMD’s appeared there was a presence that wasn’t there before. The change symbolizes a reluctant end to summer’s aquatic emergences and an anticipated shift for me to the great waters of the northwest. For the first time there was pause for reflection of a season coming to its end and one just commencing.